Winter Park Escapes offers exceptional accommodations and services which is why our reviews are 5 stars. Experience the Winter Park Resort areas finest vacation rentals at up to 50% off, plus access discounted lift tickets, equipment rentals and summer resort attractions by viewing the discounts page on our website. We also do not charge a security deposit or reservation fee and have a large inventory of additional hand picked properties to choose from. A customized concierge is also available for all of our rentals, which provides you with an entire menu of services including personal grocery shopping, private chef, special occasion gifts, holiday decorations, in room massages and custom equipment fittings at your door to name a few. Additional fees apply. THIS PROPERTY DOES NOT ALLOW PETS (NO EXCEPTIONS). The administrative fee on HomeAway/VRBO is our security deposit waiver and provides $3000 of accidental damage insurance. Winter Park Escapes is a local full service vacation rental management company specializing in premium ski in/out condos in the Winter Park Resort base village, and luxury mountain homes in the surrounding area. All of our hand picked rentals provide premium locations and views, and include many upgraded features and amenities that are not available in other vacation rentals. We are the ONLY company that provides up to $200 of free activities daily at some of the most popular attractions in the area, plus access discounted lift tickets, equipment rentals and summer resort attractions by viewing the discounts page on our website. We also do not charge a security deposit and offer an extensive menu of concierge services. All of our properties have keyless entry which allows you to go straight to the rental instead of checking in at front desk first. Our homes are equipped with everything you need for your stay and include a comprehensive guest app to help provide a 5 star experience that can't be matched. The information and pictures on all of our listings are accurate and up to date and we will respond immediately to any questions or concerns you may have while either making a reservation or during your stay. Both bathrooms are large with slab granite counter tops, custom stone tiling, tub and shower capabilities. We enjoyed our stay and loved the views! The condo had everything we needed. One thing to know if that this condo is a long walk to the elevator. Other than that we enjoyed our time there and loved that we could park our car and walk everywhere we needed. Quick walk to the gondola as well. This condo had an amazing view of the mountains and the ice skating in the village. It was far from the elevator for the lockers and the hot tub, but close to stairs that we used all the time for the garage and to get outside. We loved the fireplace and having laundry in the unit. For our family, the only issue were the beds were not very comfortable. My two sons chose to not sleep in the bed together due to that and one slept on the pull out couch and my husband and I felt the master bed had two holes to sleep in- one for each of us, which after skiing you need a good bed. Small things like my outlet did not work next to bed except for lamp but not my phone, the dishwasher is hard to roll out the trays. The dining room chairs were so worn I had to use a pillow underneath to raise myself up. We did like having the humidifier and used it everyday and I loved having the fan in the room for background noise. Thanks for a great trip overall! So glad we stayed here for Thanksgiving!! Ideally situated in Winter Park on a bright and airy corner with nice views - worth the long walk from the elevators but worth it! Underground paid parking proved to be an added bonus when 12 inches of snow fell - the trick is to park in the garage closer to the unit and use the stairs. It is tastefully decorated with a nice fireplace and a balcony. And the ski locker and hot tub were unexpected but so appreciated!! Communication was great and so responsive. Definitely recommend! We just spent a week at this location. Plenty of space for 2 adults and 2 kids. The apartment is really nicely set up, great appliances, amazing view, super close to the village. This place was also pet friendly which was a big plus. The apartment was really well kept up. Needed someone to help us with the WiFi and we got a super speedy response. It is a great location, in the middle of many activities we did as a family: whitewater rafting, Atv, hiking, zip lining and visiting Rocky Mountain National park. This specific apartment is far away from elevators, so expect some walking, but that’s what gave it great privacy. We will definitely bring the family back! Great job! This is a great resort. The room was wonderful. A really great place to stay. There is a large selection of good restaurants and a wide variety of activities, including hiking, biking and mini-golf. The facility itself was also tremendous, really nice rooms that were in great shape. The staff was also wonderful. We were there for a wedding and we worked with Logan, who was very helpful and responsive, which was great. All in all, this was an impressive resort. This unit is as nice as other reviewers have commented. It is spacious, clean, and easy to access. We will plan on coming again in the future. 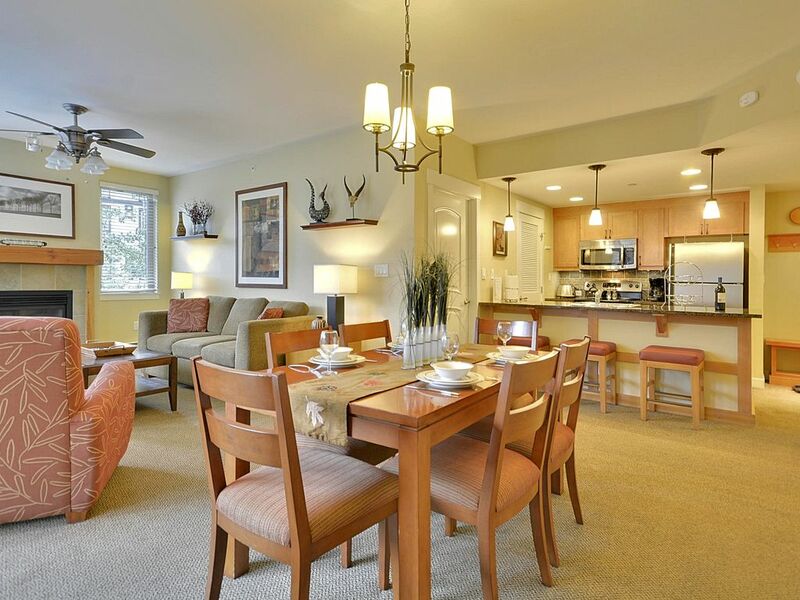 There is a lot to do in Winter Park, and we were so comfortable in the condo.